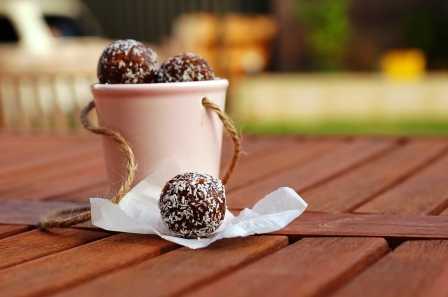 I saw these gorgeous looking Date Truffles on Prerna Singh’s equally gorgeous blog, Indian Simmer, some time ago. I finally got around to making them, then wondered why it took me so long as they are oh so easy and rewarding. Rich and chewy, sweet without being sickening, it is a damm good thing that these babies are actually quite healthy. The first batch I made ended up as gifts to friends and family in Adelaide, in colourful little jars along with dark chocolate truffles (it’s all about balance, I say!). The second batch was sent to a friend who is soon undertaking the painful and soul-destroying task of moving house. She declared it to be a fabulous ‘packing snack’, which I fervently hope meant ‘a great thing to snack on while packing’ as opposed to ‘a great snack to use as packing material’. Part 2 of the second batch made a wonderful pre-skydiving snack (yes, you heard right and more on that later). It certainly was a much needed energy hit after rising at an unearthly hour to drive ninety minutes to take the leap. The third batch- and yes, I have indeed made 3 batches in the space of 2 weeks- is sitting comfortably in our fridge waiting to be gobbled. So here goes…..the basic recipe is much the same as the original, but being me I couldn’t help but throw in a few spices. In a non-stick saucepan, melt butter. Add dates, spices and vanilla and cook on medium heat until the dates soften and start to soften and go a little gooey (about 10 mins). Place date mixture into a food processor and allow to cool a little. Process to a thick paste. Use the pulse setting. It may be hard for the blades to move through the mixture, but do not add any water. Add nuts. If using almonds or hazelnuts, I prefer to roast them in a 170-180 C oven for 7-10 mins. Process the nuts into the date mixture so that the nuts are chopped finely but not powdered (you should still be able to distinguish the nut pieces). If the mixture is very hot, allow to cool further. Pinch off small amounts and form into balls, rolling them between clean hands. I like to make the truffles about 3 cm in diameter. Place dessicated coconut in a small food-safe plastic bag (such as a snap-lock sandwich bag). 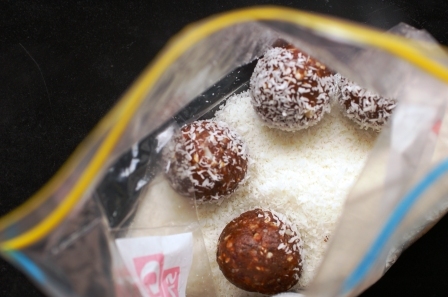 Throw in truffles 3-4 at a time, hold the bag closed and shake around so that the truffles are coated in coconut. 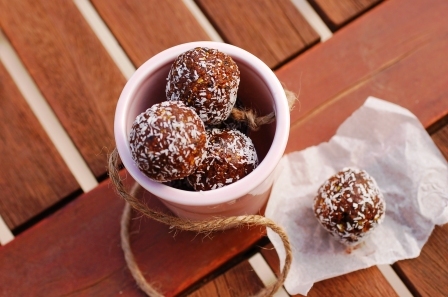 Place the coconut covered truffles in the fridge for at least a couple of hours. 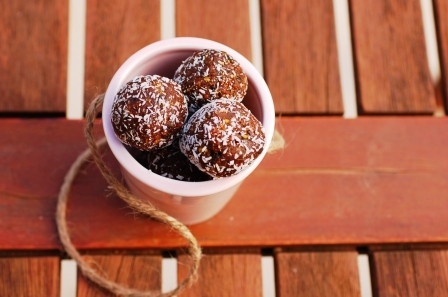 Other options are to coat the truffles in cocoa powder, as specified in the original recipe, or in crushed nuts. Gift or gobble as appropriate. Thanks Rose and thanks for dropping in. Yeah, everyone I made these for loved them too! Just had a quick look at your blog…..gorgeous, especially the photos!